We would like to bring to the attention of leprosy workers two points which appear to be of significance when reviewing treated leprosy patients for signs of the disease. A 22-year-old man had a borderline tuberculoid plaque of leprosy on the upper part of his left forearm. After 6 months of regular treatment with multidrug therapy (MDT), rifampin 600 mg monthly supervised and dapsone 100 mg daily unsupervised, the plaque subsided well and he was kept under surveillance. During the third month of surveillance, he reported with mildly pruritic, erythematous and scaly lesions on the site where the leprosy plaque had been (The Figure). The lesions were of 5 weeks' duration and did not look like those of leprosy. A scraping for fungus in 10% potassium hydroxide was negative. He was advised to apply topical betamethasone valerate and to take oral antihistaminic tablets. Within a month the lesions regressed, removing all fear from the patient's mind. A similar occurrence was seen in two more patients with tuberculoid leprosy after a 2-year surveillance period. Although these cases are seen in rare instances, it is important to recognize them so that benign lesions are not confused with signs of leprosy activity. All of our patients had features of subacute eczema with erythema and scaling. 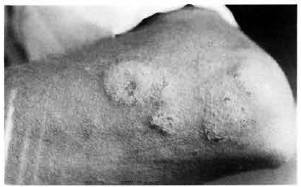 In leprosy, erythematous induration is an important sign of activity and scaling is not a feature (except in subsiding reaction). Again, unlike eczematous lesions, the induration due to leprosy gradually increases in size. A history of vesiculation dictates strongly against leprosy. The Figure. Scaly and erythematous lesions on a healed leprosy patch. Clinicians and leprosy workers should be aware of such presentations because they can easily be misinterpreted as a relapse of the leprosy. When in doubt, field workers should refer such cases to the nearest center where expert opinion and histopathological study, if necessary, can be obtained. It would be interesting to know why eczematous lesions were confined to the healed patch of leprosy. This could most likely be a coincidence or may represent a localized form of asteatotic eczema (1) resulting from the destruction of the pilosebaceous units by leprosy which was further aggravated by scratching. In the fourth patient seen by us the eczematous lesion was due to an avoidable cause. This person initially had a tuberculoid lesion on the dorsum of the right foot and a markedly thickened, superficial peroneal nerve coursing down the antero-lat-eral aspect of the same leg. During the period of MDT, two relatively asymptomatic nodular swellings had insidiously formed in the nerve, indicating abscess formation. After 9 months of therapy the skin lesion had completely subsided while the residual nerve thickening and the nodules persisted. The surveillance period of 2 years was unremarkable, and he was declared cured with the reassurance that the nerve thickening and nodularity were likely to remain for a long period but required no treatment. Some months later he came back with an erythematous, crusted and oozing eczematous lesion around a discharging sinus at the site of a nerve nodule. History revealed that a doctor in his home town had tried to aspirate the nodule. Symptomatic therapy along with systemic antibotics cleared the eczema and, after weeks of proper care, the sinus showed signs of healing. To avoid such complications it is important to mention in the discharge slip that these nodules are best left alone in the interest of the patient so that no doctor attempts to tamper with them (2). - V. Ramesh, M. D.
1. Burton, J. D., Rook, A. and Wilkinson, D. S. Asteatotic eczema. In: Textbook of Dermatology. Rook, A., Wilkinson, D. S. and Ebling, E. J. G., eds. London: Blackwell Scientific, 1986, pp. 382383. 2. Saxena, U., Ramesh, V., Misra, R. S. and Mukherjee, A. Nodularity of the nerves in treated leprosy. Int. J. Dermatol. 29 (1990) 497-499.